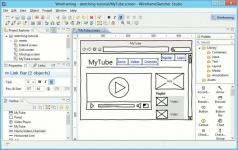 WireframeSketcher is an advanced application that enables developers and project managers to create mockups for desktop, web-based and mobile applications. The program includes a comprehensive object library which contains numerous elements that can be used in sketches like buttons, sliders, lists, check boxes and other user input items, containers, icons, labels, text areas, lines, geometrical shapes, splitters, and tool-tips. Furthermore, Wireframe Sketcher includes images, videos, charts, cover flows and maps while also allowing you to insert annotations into your projects. It is possible to edit, resize, duplicate and group objects, anchor them to the edges of a container, reorder an item, link objects and align them. You can copy the entire layout or just a section of it to the clipboard, export it as a PNG or PDF file, or upload it to the cloud, generate a link and share it with other team members.